LAWRENCE — Robben Island, just off the coast of Cape Town, South Africa, today is a UNESCO World Heritage Site best known for serving as an apartheid-era prison that held Nelson Mandela and others for decades. As a historical site in South Africa's national memory, today Robben Island is largely viewed as a symbol of the racism and oppression of apartheid while also revered as a reminder of the price paid for freedom. Yet, to Elizabeth MacGonagle, University of Kansas associate professor of history and African studies, the conversation surrounding Robben Island is largely missing other important historical context, especially with the island's proximity to Cape Town. "The city is a product of slave labor, and there were more slaves than free people throughout most of the 18th century living and working in the expanding city," said MacGonagle, who also directs the Kansas African Studies Center. "Yet the standard history surrounding Robben Island does not embrace this past even though the leaders of slave revolts and others were exiled to the island." 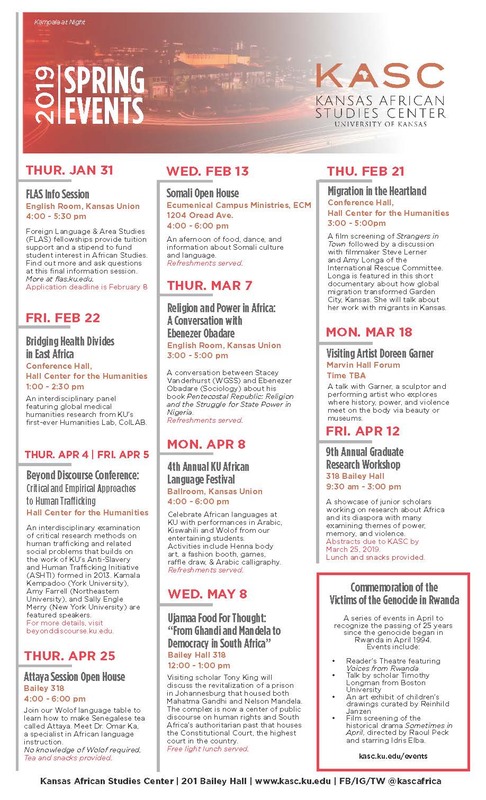 MacGonagle explores these issues in her recent essay "History and Memory in an African Context: A Case Study of Robben Island," which appears in the book "Area Studies in the Global Age: Community, Place, Identity" from Northern Illinois University Press. She said a more complete picture would focus on Robben Island's history beyond the more recent jailing of political activists because the island was long used as a place of banishment prior to that. "The brutal history of enslavement and the vast contributions that slaves made to the city remain largely untold," MacGonagle said. "Robben Island is a part of that story." The history of Robben Island is an example of the tension between historical sites that become forward-looking, as opposed to capturing a site's past, she said. Although it is possible to do both, museums and monuments can lose relevance without considering how the present influences the past. "Heritage is as much about the present as the past," MacGonagle said. "And, given the many abuses of history, we need to be mindful of whose history is represented. The selection, rejection, erasure and promotion of the past are just as connected to demands today as they are to historical realities." Some of the research for the essay informs part of her book in progress about several African sites of memory steeped in the heritage of slavery, including Cape Town, Ghana and Mozambique Island, which served as an important port for the Indian Ocean trade in slaves and later indentured servants. 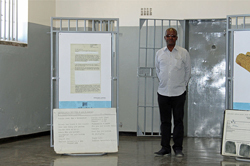 Robben Island has in a sense become part of a national myth that appears to be authentic and highly symbolic with the focus on political prisoners from the apartheid era. In many ways that history is important, and the stories are powerful, she said. Former political prisoners served as tour guides at the prison, for example, when MacGonagle visited there as part of her research. "Other scholars have convincingly argued that the former prisoners' ability to offer their own personal interpretations and representations of what occurred on the island is clouded by a dominant public narrative about a more collective struggle against apartheid," she said. "I do think the involvement of former political prisoners on the tour serves to provide powerful information about the grueling and inhumane conditions so many endured on the island." Still, she hopes more inclusive histories will also develop in the future, particularly from oral histories about how slaves were imprisoned at Robben Island so that their voices could also be heard in the same way the former political prisoners' have been. The book's editors are Edith Clowes, a former KU faculty member, and KU graduate Shelly Jarrett Bromberg. Several other KU faculty members and graduate students contributed essays to the work as well. Photos, from top: A view of Robben Island from Table Mountain. Middle: Former political prisoner Vusumzi Mcongo, who was imprisoned on Robben Island from 1978 to 1990, now works as a Robben Island Museum tour guide. Photograph taken inside communal cell in Robben Island Maximum Security Prison. 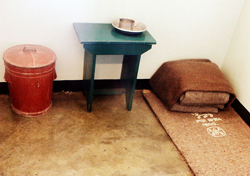 Bottom: Nelson Mandela's prison cell on Robben Island. Photos via WikiCommons.